Why Is Digimon World Re Digitize Decode Not Available In The U.S.? I have a soft spot in my heart for the Digimon series. I dare say I even like it better than the more popular Pokemon series. The Digimon World games were always one the best parts of the franchise. 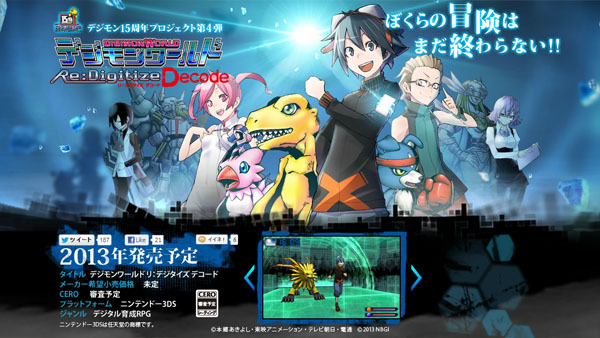 Digimon World Re Digitize Decode is an expanded 3DS version of the PSP game that came out a year ago. It plays similar to the first Digimon World game that came out on the PS One more than a decade ago. So far the game is Japan only and it really makes sad, as I would love to play a new Digimon World game. Your grammar made me cry. Sorry, that’s what happens when I try and make a post at four in the morning. I will make sure it does not happen again.